The final samples are based on ideas recorded on sketchbook page 47, 11-Feb-2016 and previously shown 15-Feb-2016. They were based in a few ideas – returning to the corrugated surface I found effective in earlier samples in the course; returning more closely to the casting of the internal space of vessels as in Assignment 3 (I’ve felt at risk of venturing too far from the basic course parameters); and bringing together my main materials – resin, plaster and the orange organza. This vessel could easily slot into Assignment 3. Some corrugated plastic shelf liner was used the create the external shape, which was deformed by tying and pressing in lumps of plaster left from previous sampling. 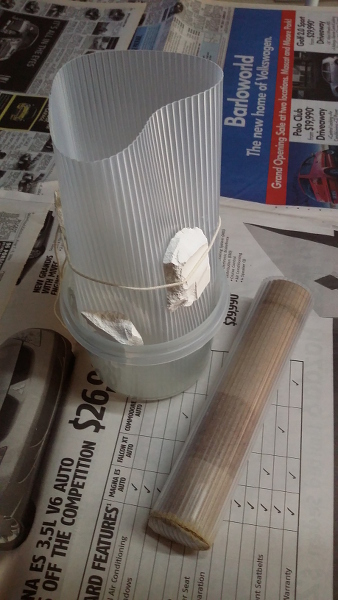 To form a “vessel” rather than the more generic “object” a cardboard tube was wrapped in more corrugated plastic and held in the poured plaster as it was setting. The shape gently undulates, emphasised by the ridges of the corrugation which respond to lighting with gentle shadows. The colour and form are calm, solid. The shape is quite compact, standing around 10 cm high. I find its proportions satisfying and it attracts the eye and the touch. I regard this as a very successful sample. It is also useful in the collection, being less aggressively showy than some other vessels but with a lot of its own quiet character. Its movement is within clear boundaries, providing a solidity and stability. Sample p5-12 had a similar genesis. 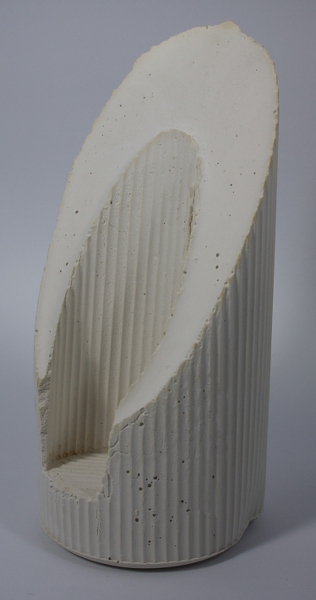 A tube held corrugated plaster in a firm column. What was intended to be an internal space was made with a cardboard tube covered in plastic. While setting the mold was supported at an angle, impacting on the shape of the cast vessel. Limited visibility and buoyancy of the inserted tube resulted in the internal void touching a side of the vessel. I was very tempted to stop with the sample in this form. It created an interesting contrast to p5-11 and I found it visually appealing. The idea of potentially ruining it was unattractive. However this course is all about risk and I continued. The vessel was returned to the mold, but this time held upright rather than at an angle. 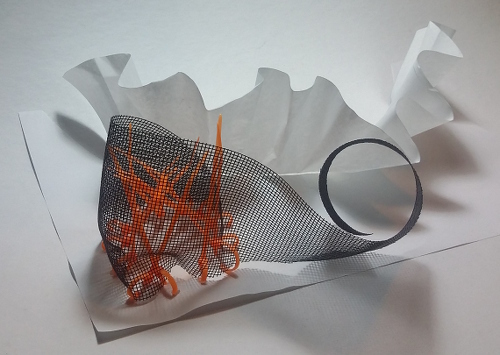 A large piece of orange crystal organza was heat distorted. It was then soaked in liquid resin and pressed onto the plaster in the mold. There are some technical issues in the outcome. I didn’t push the plaster vessel firmly into the mold and a rather odd foot of resin formed. It’s only attached along a small part of the edge, and it’s not clear how stable and long-lasting it will be. 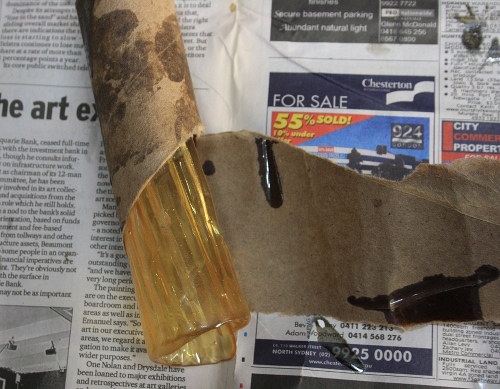 The bottom of the cardboard roll and inner plastic set firmly in the resin. I was able to cut away most, but the bottom of the void is unsightly. I would prefer more dribbles of resin down the sides of the plaster. I find the uneven patterning unattractive. On its own the form is much more static than the other pieces in the collection. Its strength lies in combination. I find this first grouping very exciting. These three samples, with all their individual idiosyncrasies, clearly belong together. They respond to each other. I’m beginning to get some very interesting results in the interactions of the collection. There was some resin left over after making sample p5-12. 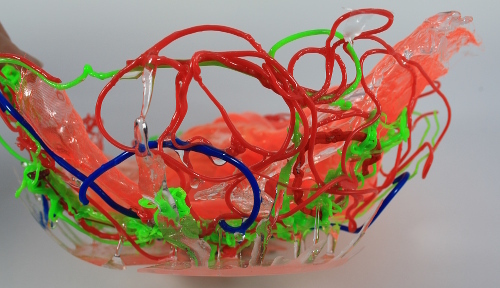 Sample p1-59 (20-Apr-2015) was quickly jammed into a plastic bowl, a piece of (undistorted) orange organza was thrown in, and the setting resin poured and scrapped on. So much planning and effort went into p5-12, virtually none into p5-13, but in the context of the collection the result is wonderful. I’m really looking forward to mixing it in with the group. It’s lively, unexpected, fascinating, exciting, energetic. To whet your (and my) appetite, some quick shots of my work area. You will no doubt appreciate, as I do, the extensive tidying up that happened yesterday. My initial list of experiments using resin (26-Jan-2016) included the use of colouring agents. I added some cyan ink to the resin then dribbled it over some corrugated plastic – the same plastic used as a mold in sample p2-5 (31-Jan-2016). This didn’t go well. The stored resin had gone grainy and hasn’t cured properly. The resin just dribbled off the plastic into a bowl, leaving a gritty residue. The plastic sheet was embedded in the dribbled resin and I can’t separate it. The resin is coloured, but has a cloudiness to it – which could be a product of the other problems, not necessarily the ink. Still, I think it made an interesting photograph on the concrete driveway. Sample p3-53 (1-Oct-2015) explored developing a casting sample by throwing it repeatedly onto a concrete floor. 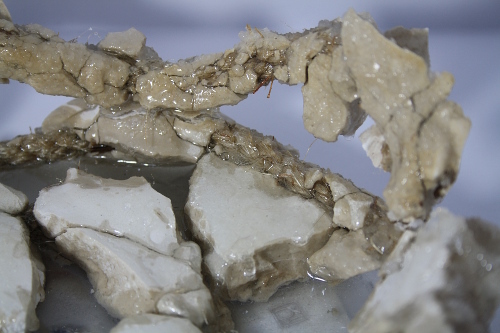 Could the remains be used as the starting point for a new sample, a vessel? Shards of plaster were still attached to rough rope. I coiled the rope in a plastic bowl, then dribbled on resin. This was done in two sessions a week apart, trying to build connections between the broken parts. Once again the resin is grainy and not fully cured. I wasn’t successful in forming sufficient links to make a robust vessel. I wasn’t able to separate the results from the plastic bowl. The plastic was broken up using a hammer and most of the vessel released, but there is still a lot of plastic in the base. Still, the result has promise. 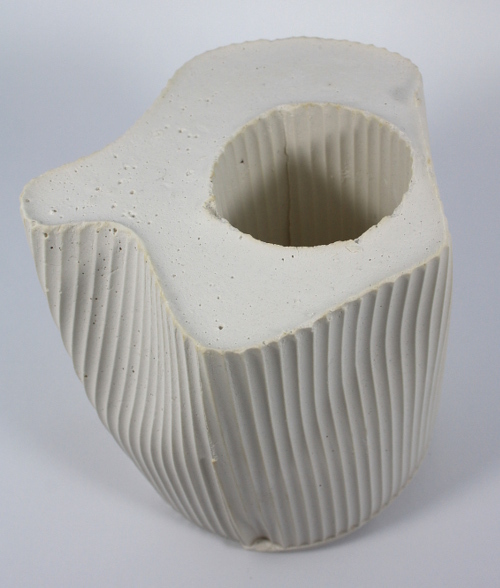 There are multiple interesting shapes, interesting views through the spaces in the vessel. It is a bowl form but clearly not functional. It is broken parts “mended” in a new form with voids and lines that don’t quite make sense. There are so many textures. It holds the gaze. This sample is a continuation of the ideas behind p3-47 (26-Sep-2015). I developed the idea for p5-8 and p5-9 in my sketchbook, page 40 2-Feb-2016, posted 8-Feb-2016. A section of the same cardigan was used to line a round plastic bowl. Stitching was used to gather the cuff hem of the sleeve, which then fit neatly around a found glass form. The covered form was suspended over and into the bowl. 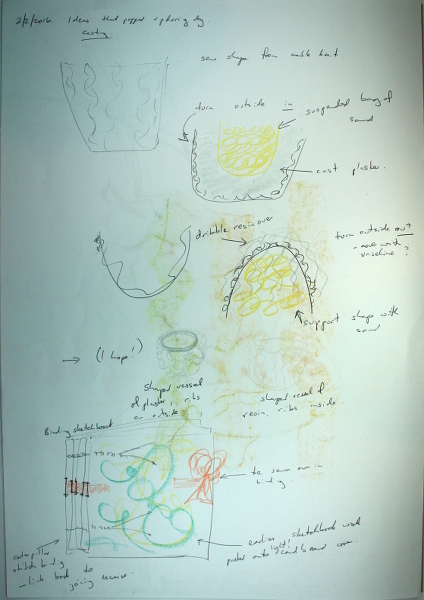 The idea was that suspended glass would create the central void in a new cast plaster vessel. No additional lining was used, and a small amount of plaster seeped through the knitted fabric. However what looked like a disaster in progress was actually minor spillage, as the plaster set quickly.(26-Sep-2015). 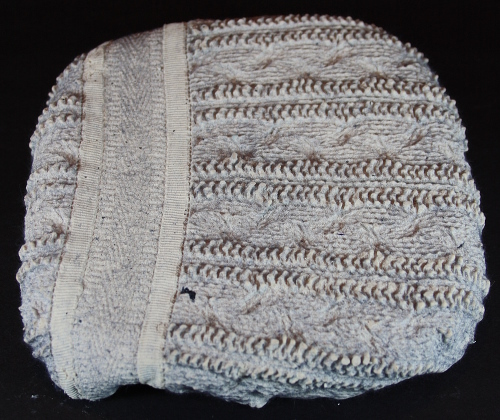 Additional strips of knit fabric were laid on the surface of the plaster, between the inner and outer forms. As a result virtually the entire cast vessel is textured by the knit. 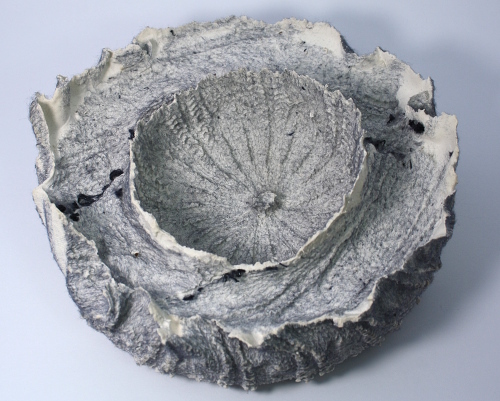 The photographs shown here were taken over a week after the vessel was cast and it is not yet fully dry. Given the experience of sample p3-47 I expect the colour to lighten considerable over coming weeks. I expected the rim of the cast vessel to be wide and basically flat albeit textured. Instead there is a splash effect with high, fluted inner and outer edges to the rim. I believe this is due more to shrinkage of the plaster during drying, with only small impact from the seepage. The result is in my eyes at least both ugly and beautiful. The shape seems familiar but wrong. It is both solid, heavy and delicate, fragile. The lines of texture move in a way that is both dynamic and unsettling. In earlier research of work by Victoria Brown (14-Aug-2015) and Rebecca Fairley (16-Aug-2015) I commented on the fibres caught in some cast works, an effect I find attractive, that adds interest and speaks to the processes creating the work. In p5-8 there is a haze of fibres over most of the vessel, and a few fragments of yarn caught in lines in the rim. Those threads follow the lines of movement in the molding, emphasizing the swirling flow. I have been trying to make a video to show this more clearly, but grey, matt, slightly fuzzy surface is proving difficult for my current basic equipment to light and focus. Work continues. In this vessel the second sleeve of the cardigan used in p5-8 was sewn and placed over the same glass shape. I smeared the knit heavily with vaseline, hoping it might act as a release agent, then dripped and poured resin over the form. 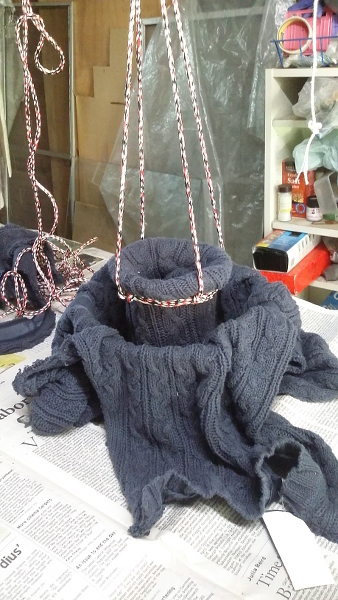 I expected to be able to extract the glass with little difficulty, and hoped that I might be able to pull away at least sections of the knit to leave the major part of the new vessel resin. In practice I have been unable to separate resin, knit and glass. I was able to neaten the top edge, grinding with my new dremel tool (purchased after Graham Marchant’s class (24-Jan-2016) for using in lino cuts). The vessel is heavier and darker than I intended. The form is simple and there is little visual interest. However internal lighting allows appreciation of the knit fabric. Next time I am using resin I may run a bead around the rim to tidy it up a bit more. I don’t see this as an entire failure, but neither is it a success. 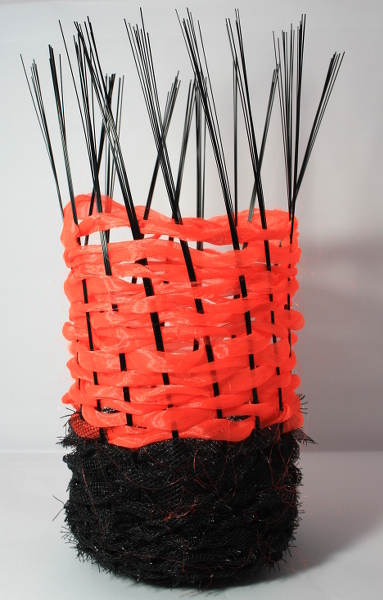 The idea of this woven vessel began in my sketchbook, page 43 5-Feb-2016, posted 8-Feb-2016. It was influenced by my research of Anne Dyke’s work, 7-Feb-2016. I’m actually booked on a one-day workshop on coiling with Lissa de Sailles (class link), but that’s over a month away. 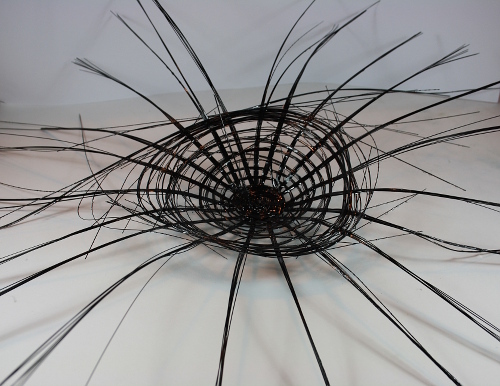 I decided instead to weave the vessel – a technique I have already used in my collection in p5-5 (31-Jan-2016). 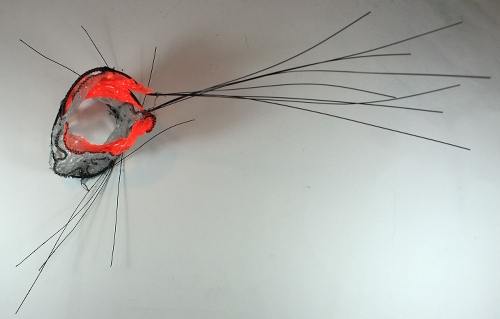 The main structure is the plastic horsehair. 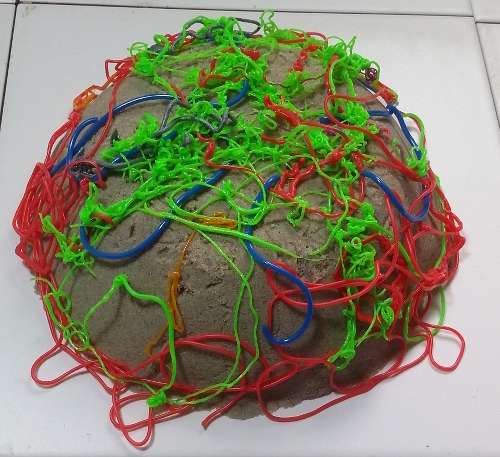 The base and lower section is yarn made from fibreglass insect mesh, seen many times during this course including in wrapping sample p2-74 (28-Jul-2015). 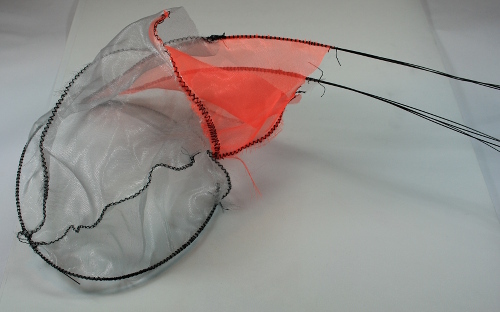 The upper part is woven with strips of orange crystal organza, very loosely twisted as I hoped to get some movement and a light, lacey effect by using a heat gun on the woven form. For the same reason the organza weaving was left open, not packed down tightly. The heat treatment gave a lot of distortion in the organza, as hoped for. It is not lacey, but there is a light solidity. An unexpected element was the response of the plastic horsehair to heat. It curled and frizzed and dropped to create some very exciting lines. I find the resulting vessel a delight. It has become an avocado shape and both expands and is more contained than some of the earlier samples. 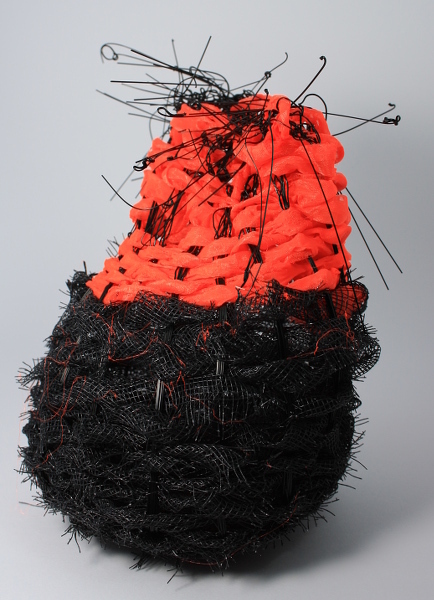 I particularly like the flecks of orange threads on the black base, a by-product of tearing the organza strips. I originally intended to drizzle resin on the final form, but haven’t followed through with that (yet??). The vessel is already very interesting and structurally quite stable. I like the contrast of the relatively matt and deeply textured surface as a contrast to other pieces, especially p5-4 (31-Jan-2016 and 5-Feb-2016). The photo below shows the two together, with all their contrasts of shape, texture and line. I think this is a very good example of the interaction I was hoping to get in my collection of vessels. Looking at this reminded me of one of my most successful samples of the course, p2-18 (19-Jun-2015). I think my collection could be enhanced by revisiting earlier work. In my Review wrapup (26-Jan-2016) I identified a number of initial sampling ideas. I set up those and even more for my first work session, leading to my first failure. The resin had settled into soft crystals. With lots of stirring I was able to get some out of the container, then lots more stirring with the hardener to mix thoroughly. While brushing and dribbling I began to notice the resin warming, then suddenly it was semi-solid and smoking hot – too hot to touch in my nitrile gloves. So I have a lump of semi-cured resin and a number of samples still in progress. Lesson learnt – I’ll have to accept that this process needs time and small batches. Sample p3-3 was brushed with resin. Most dripped off and I have not been able to remove the thin film of resin that remains. The surface is now glossy, but I can’t see any advantage of combining the two materials. Possibly I should try again with a barrier at the edges to ensure a thicker resin sheet which might be easier to separate, but I don’t currently see this as a strong contender for development. This sample was based on the idea of columns of vessels with a corrugated surface (sketchpage 024 18-Jan-2016). Composimold was poured onto a plastic sheet with corrugations (in past life packaging for a set of pencils). It was rolled and slid into a cardboard tube to hold the column shape. The tube was held at an angle in a bowl and resin was dribbled in. 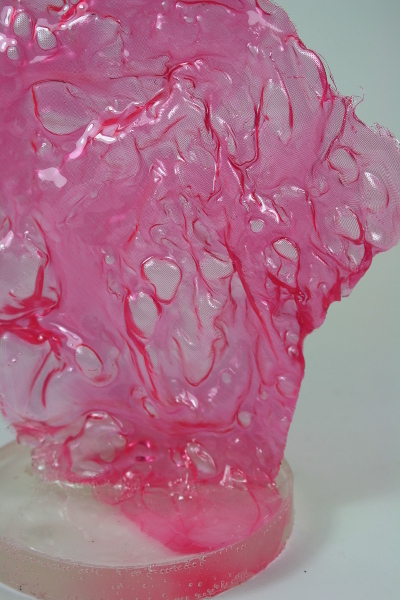 Given the heat generated by the resin I expected the composimold to melt into a lump. However the next day it appeared intact and I was able to peel off the cardboard tube. The resin came away easily. Composimold is a good candidate for creating molds in future samples. However having been placed on an angle most of the resin had simple run through and only a thin film was left. In this photograph I’ve left the resin partly on the mold, and the combination of materials creates an exciting combination of shape, texture and reflective properties. Soon after the materials relaxed and they now lie flat. However it is clear that there is a lot of potential here. This is a combination of materials and form that I would like to take further. This sample started with print p4-32, reshaped into a bowl form. 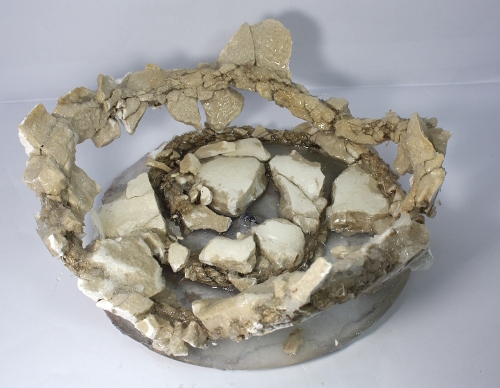 The form was placed in a plastic bowl to help retain shape during resin application. Resin was poured and brushed on. In the photograph above a small LED has been placed in the bowl. When exploring all of the samples in this post I was aware of reflections of light. I would love to see all of them in good gallery lighting, which would really bring out the sparkle of the faceted surfaces. The bowl is around 16 cm in diameter and 10 cm at its highest. It is light but quite stiff. The resin will continue curing and gaining strength over the next few days, so I haven’t put a lot of pressure on it. I think this result is delightful. 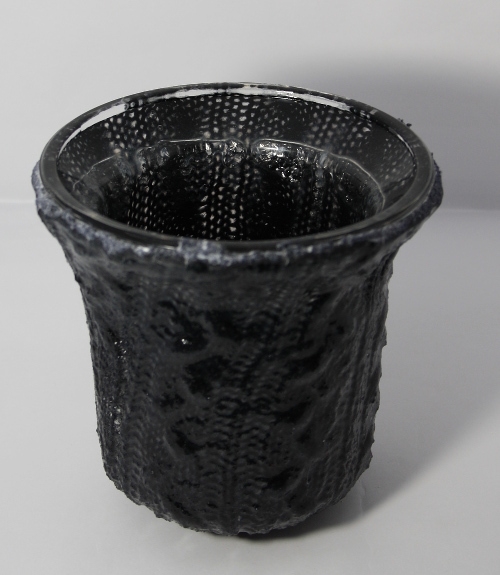 There is potential to go back to all the crumpling techniques and printing techniques to create a series of vessels in different shapes and sizes. Perhaps it could be a way to record and develop shapes such as those created during the casting project. Peering into the centre reminds me of Liu Jianhua’s ceramic series (30-Jan-2016). A low display, perhaps with some taller vessels and playing with reflections, could be effective. This sample was intended as a development of p3-46. 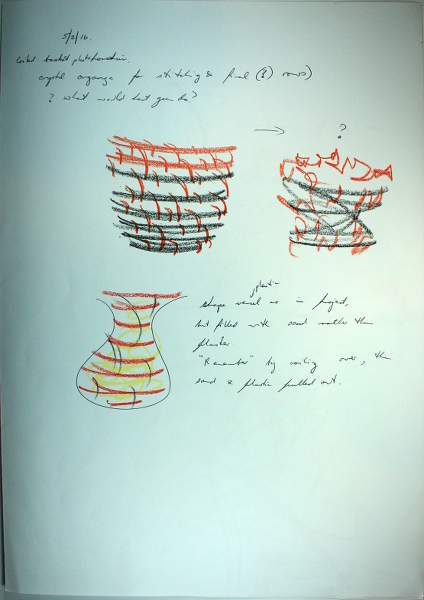 The shape was based on a vessel of enameled copper by June Schwarcz (https://enamelguild.org/june-schwarcz/, sketchbook page and research yet to be posted). 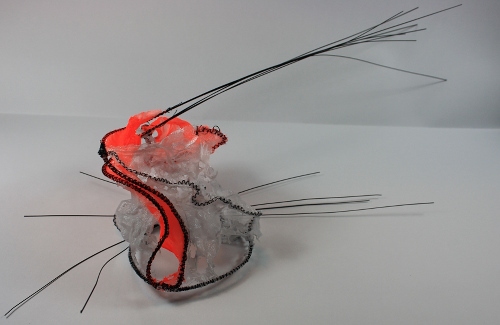 I began with some roughly cut triangles of crystal organza, pinned together to make a tube. I wanted some sparks of colour, so included two orange pieces amongst the grey. One of my development plans was to use more of the plastic horsetail, leading to a decision to sew in black thread, then oversew some seams to capture the plastic threads. At this stage I was doubting my taste level, but I’ve written recently of the feeling of daring myself. This is the piece I referred to in my reflection on tutor feedback (28-Jan-2016). I kept going, wanting to learn as much as possible from unpromising beginnings – and just maybe there would be a surprise. Holes appeared almost immediately when using a heat gun. 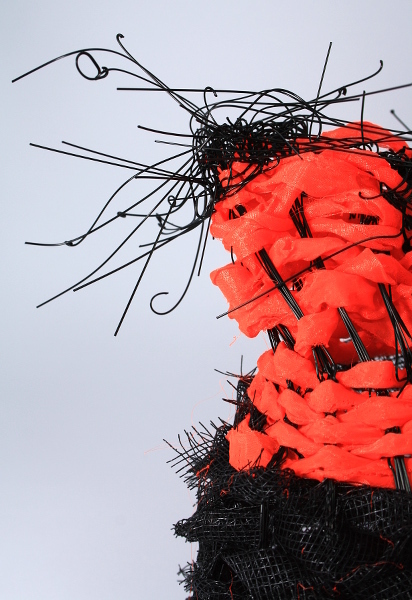 This aligns with earlier experiments – if the fabric can’t shrink and distort, holes appear. In the current sample the stitching held firm and put pressure on the fabric. I suspended the shape and brushed and dribbled resin over it. The final result is stiff and sits stably on the worksurface. The main part is 7 to 8 cm high, the plastic spikes rise to 20 cm. I find it intriguing. It bothers me. It’s ugly and misshapen and awkward, but… The overall shape is dynamic. It claims space in a way that I find effective. There are the seeds of something that could work for me. If I don’t look at the detail, or only the right detail, it’s exciting. This sample evolved as I was working on it. First it was going to be a bowl based on sample p2-57. I couldn’t find the bundles of yarns used then, so decided to substitute plastic horsehair. I was thinking something smooth and elegant. I wanted to shape the braid over a form – a balloon. 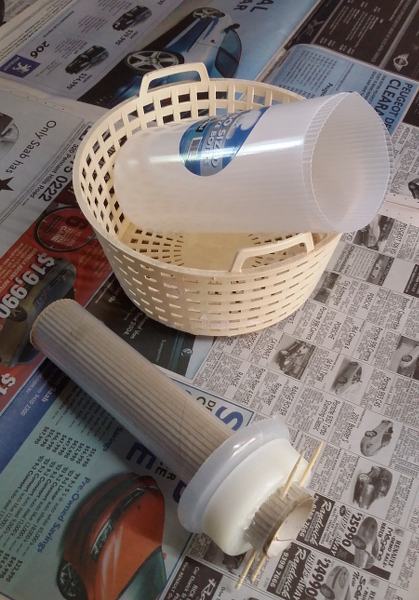 The plastic was very difficult to work with and I just couldn’t manage it. So I decided to switch to basket weaving. 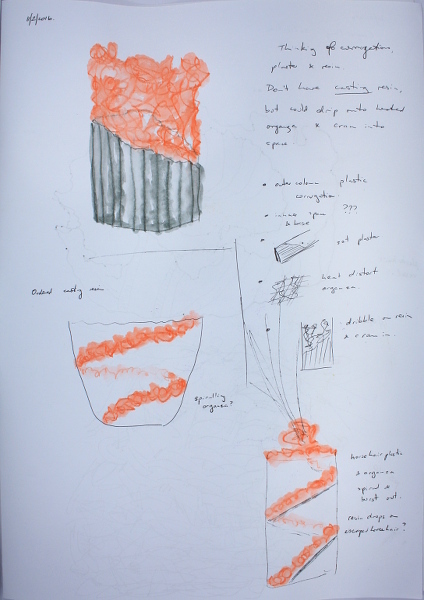 There would be challenges with the fairly short lengths of plastic, but that could lead to spiky shards, as seen in early sketchbook work (sketchpage 005, 10-Jan-2016). It was a struggle. There were loose ends everywhere, everything sliding around. I had little to no control over the shape, which could be an issue if developing the sample. A sensible approach could be to combine with another material, but I really wanted the initial sample to be a “pure” exploration of my material of choice. The final form was fragile. Individual threads could slide around and it seemed at any moment the entire thing could fall apart. However I was able to suspend it from three of the base groups of threads, and paint it with resin. The process was slow, and it was during this that the resin heated and smoked. My photographs don’t do the sample justice. There are droplets of resin of various sizes all over it and they sparkle catching strong light. It casts wonderful shadows. There is an airiness and light to the structure. 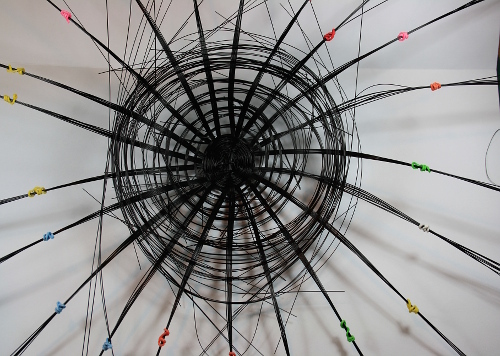 The form is around 60 cm wide, but a couple of outstretching threads take it to 90 cm wide. The rim of the bowl sits 5 or 6 cm above the work surface. If I can learn to work with the material there is huge potential here. I need to work on my lighting and photography to communicate this. I feel I’ve learnt a lot from this first set of samples. My resin handling is already improving. I need to work on my lighting and photography. One or two of the samples could be included as they stand in my collection. Sample p5-4 looks much better in combination with p5-5. It starts to become an interesting variation rather than just an isolated oddity.